We have arrived at a personally exciting point for me in this retrospective of Godzilla pictures. 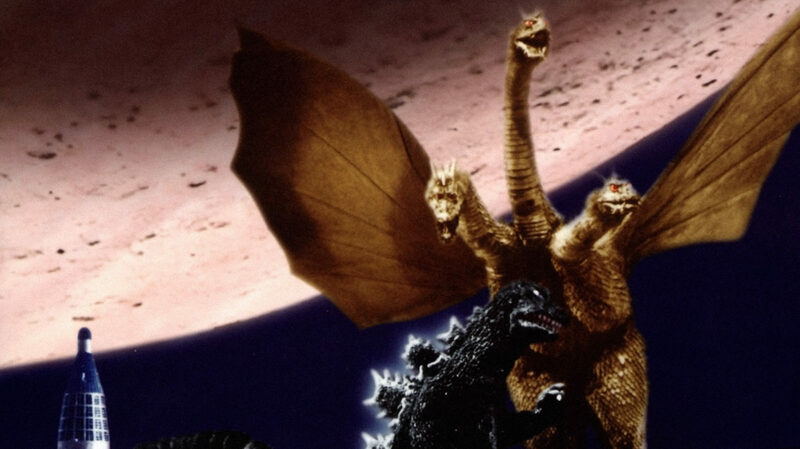 Up until 1964's Ghidorah, the Three-Headed Monster, I had already seen all of the movies, if only in a compromised English dub. But from this point, it's several weeks straight of movies entirely new to me. And what a doozy to kick things off! We now arrive at 1965's Invasion of Astro-Monster, first released in an English dub as Monster Zero, which is the probably the more appropriate title. Either way, it's the film where the Godzilla films (of which it is the sixth) finally committed themselves entirely to the business of being artistically dubious B-movie, inasmuch as they hadn't been B-movies before this. Still, there's a qualitative jump from the things that even King Kong vs. Godzilla or Ghidorah, the Three-Headed Monster are, to the thing that Invasion of Astro-Monster is. Even that more official English title promises a certain degree of disreputable juvenalia (much more so than the original Japanese The Great Monster War, at least), and this promise is entirely fulfilled. With Invasion of Astro-Monster, we have the first - but not the last! - marriage of a Godzilla vehicle with a space invaders plot, of a sort much more characteristic of the 1950s than the 1960s. And as any habitué of Japanese space invaders films can tell you, they come in a very... special form, in that country. A sort of aura of a well-heeled high school drama club project, you might say, in which the most conspicuous feature of the sets and costumes is how visibly they've been redressed from stuff everybody could go out to the store and buy. By all means, Invasion of Astro-Monster is closer to the best of these films than the worst, and while Toho might have decided by this point to downgrade their iconic daikaiju from the A-list star to matinee figure (or whatever the Japanese equivalent to a Saturday matinee would be), the full effects of that shift weren't to be felt in this film yet. I take this to be in no small part thanks to Honda Ishirō, who had at this point directed four consecutive Godzilla films, that streak ending hereafter. Even when he plainly did not care for the direction that Sekizawa Shinichi's at times very flighty screeenplays were going, Honda nearly always treated the material with respect and dignity, and this emerges in Invasion of Astro-Monster in a weirdly serious movie for such junky material, with the actors all kept tightly reined in from the traditional fluffiness that would almost inevitably have crept into any other film made from this scenario. I don't know if that's necessarily enough to make Invasion of Astro-Monster "good", but it's presented in such a strait-laced, camp-free way by the directing, the Koizumi Hajime cinematography, and the Ifukube Akira music (which has much more of a rousing, militant flair than most of his scores in the franchise) that it has a sheen of potency and quality that even manages to make the weird costume and make-up used to create the inhabitants of the mysterious Planet X look like something out of a legitimate movie, no matter how objectively ridiculous they look. Which is pretty goddamn objectively ridiculous. The film takes place in that old standby, 196X, meaning that it couldn't be more than four years in the future when the UN sends a two-man spacecraft, the P-1, to investigate the newly-discovered Planet X out beyond Jupiter. These astronauts are the American Glenn (Nick Adams, who appeared in Frankenstein Conquers the World earlier in the same year), who lacks a surname, and the Japanese Fuji (Takarada Akira), who lacks a given name. Meanwhile, back on earth, Fuji's sister Haruno (Sawai Keiko) is dating the hapless geek inventor Tetsuo (Kubo Akira), who has just invented some kind of ludicrous noisemaker and sold it - the first success of his professional career - to a toy company representative, Glenn's new girlfriend Namikawa (Mizuno Kumi). 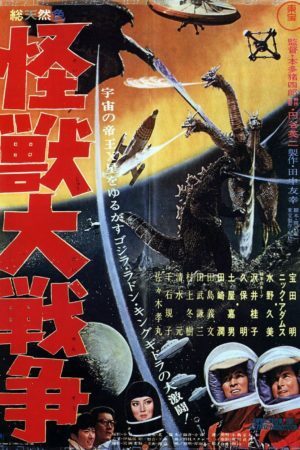 This coincidence isn't, as it eventually turns out, but long before then, Glenn and Fuji make landfall on Planet X, where they meet the not at all suspicious Controller (Tsuchiya Yoshio), who makes a not remotely too good to be true offer: if the people of Earth will allow Planet X to borrow Godzilla and Rodan, the X-ish scientists will share their cure for cancer. And why does Planet X need a pair of daikaiju? Because they've been under attack for some time by a being they call Monster Zero, better known to us Earth people as the three-headed space dragon King Ghidorah. It's not remotely surprising - especially because of the Controller's evil, purring laugh when the humans head back to Earth - that this deal is just a blind: the Conroller can use mind control over all animals, and King Ghidorah, Godzilla, and Rodan are all under his power; the alien civilisation thus is able to start wreaking havoc on Earth until humankind submits to Xian rule. But all is not lost! It turns out that Tetsuo's ridiculous gadget makes a certain kind of noise deadly to the people of planet X, which is why Namikawa - a robot spy sent to destroy Earth's defensive capabilities - wanted to hide it away. But time spent with Glenn has taught her the Power of Love, and she defies her programming to communicate the knowledge needed to save the world from the giant monsters' all-out attack. It is all very dumb. But there are gradations of being dumb, I'd argue, and Invasion of Astro-Monster, kept aloft through some very solid filmmaking, manages to be effective and engaging regardless. Even Sekizawa isn't completely wallowing in his own silliness; the story he provided this time out is one of the tautest in the Godzilla series, in which there's not even the slightest gap between the human and monster elements of the film, for indeed they aren't "elements": there is one dramatic conflict, one throughline, and the humans in space, on Earth, and the giant monsters around them are all part of that. It's clean and efficient in a way that Godzilla movies rarely are. That being said, its intelligent and story-driven use of the monsters is only so much of a comfort when the monster action is this impoverished: with footage copied from both Ghidorah and Rodan, this is not the first Godzilla film to steal footage from elsewhere in the series, but it's the first one where that theft is so ineptly done and obvious. And the new material isn't really all that good either, owing in large part to the massively redesigned Godzilla and Rodan suits; Rodan looks probably a bit better (certainly less bird-like) than he did in the last film, but the new Godzilla is the worst-looking since 1954's Godzilla started the franchise with its uncertain, rubbery mess of a monster. This was a conscious effort on Toho's part. Now that Godzilla was officially a good guy, he couldn't look as scary, so his snout was rounded down, his muscles were smoothed out, and his eyes were enlarged and brought forward - it is the Muppet Godzilla, in effect, pleasant and warm and cute and this is not my Godzilla. The only real upshot is that Nakajima Haruo, in the Godzilla suit, seems to have been much aware of the new freedom granted to him by the transformation of his character from gigantic, symbolically destructive hell-lizard into a giant human being with a tail and dorsal spines, and he's playing an especially human Godzilla this time around in a way that isn't great for the drama or action, but makes for a more personal and charming Godzilla than ever before. There are certainly problems, most significantly an infamous victory dance on Planet X - improvised by Nakajima and enthusiastically endorsed by effects director Tsuburaya Eiji, disliked greatly by Honda, and included in the final cut only after much hand-wringing - but for the most part, Godzilla is enough fun to watch here that I'm somewhat inclined to say that the film's unimaginative fight scenes and the limited screentime given the monsters are a smaller problem than might easily have been the case. Besides, there's a lot of good effects work to make up for it: considering what was obviously a reduced budget (if nothing else, Mothra had to be written out when the filmmakers discovered they couldn't afford her), Tsuburaya gets some fine shots put together on the surface of Planet X, and there are explosions near the end whose abrupt, unfussy cheapness ends up making them seem somehow more unique and startling than they might easily have been. It's all pretty trivial sci-fi adventure nonsense, defensible only in that it has been made with unusual care and gravity, but trivial sci-fi doesn't have to be unenjoyable, and this much, Invasion of Astro-Monster certainly is. Perhaps it is the first Godzilla movie which feels like it materially lacks imagination and and spectacle - it absolutely will not be the last - but the transformation to a genre even more threadbare and goofy than the daikaiju eiga was handled with unexpected skill and fluidity here. Kiddie B-movies, after all, can be well-made or not, like anything else, and Honda was too good of a craftsman at this point to sign off on careless junk.